Jews are not Semitic, they are not Semites. Truman is often portrayed as an unequivocal supporter of Zionism and the establishment of Israel, but by late May 1949 he was clearly extremely frustrated by the Israeli duplicity and intransigence which was already destroying the first (and best) Israeli-Arab peace process. This op-ed originally appeared in the July 18, 2003 edition of the Forward. Okay, the Richard Nixon tapes were one thing. But Harry Truman? A heroic president to Jewish people, with institutes and forests in Israel named after him – and now we learn from the recently discovered Truman diaries of 1947 that he, too, was capable of the most sordid anti-Semitic attitudes. First, Truman’s comments remind us how strong anti-Semitic attitudes were in the United States during the 1930s and 1940s. America, for reasons of history, of constitutionalism, of diversity, was never a place of pogroms or other violence against Jews the way Europe was. But prejudice toward and stereotypes about Jews were pervasive. Seventeen years after Truman’s diary was written, the ADL found that 29% of Americans had anti-Semitic attitudes, including views of Jews as dishonest in business, as caring only about themselves, as not loyal to America, as having too much power. Remember that during the late 1930s, “Radio Priest” Father Charles Coughlin was heard by millions of Americans every Sunday night articulating the vilest attacks toward Jews. And in 1940 and 1941, when America was deciding whether to join the allies in the war against Germany and Japan, Charles Lindbergh created the America First movement, which drew the support of many millions of Americans. A major tenet of America First was the belief that it was the Jews who sought to bring about American intervention for their own selfish interests and against the interests of the American people. Keep in mind that educational programs to encourage tolerance were not a hallmark of America in those days, as they are today. Children who were taught prejudice at home or in church had fewer opportunities to unlearn their prejudices. Of course, the most significant perspective in which to place Truman’s views is the historical impact of his presidency on the Jewish people. In that regard, whatever his cultural views of Jews, his contribution to Jewish history is unique and everlasting. His decision to support the creation of the State of Israel despite the opposition of such powerful figures as George Marshall makes the diary comments pale in significance. Why Truman stood up for Israel at that critical moment has long been debated by historians. Seeking Jewish votes in 1948? His friendship with Eddie Jacobson? Biblical beliefs about Israel? Feelings for the Jewish people’s suffering? In the end, the decision speaks for itself. Recognizing that the revelations in Truman’s diaries reflect the resiliency of the anti-Semitic virus, are there lessons for us in the 21st century? For one, it reminds us to avoid complacency about anti-Semitism. Even in America, the place for a different kind of life for Jews, anti-Semitism has resilience in quarters where one might not expect it – Harry Truman, a highly respected progressive national leader; Billy Graham, the most prestigious religious figure in the country. Even as discrimination against Jews disappears, as attitudes improve, as Jewish security is strong, what people think and feel and say in the privacy of their homes or boardrooms is still uncertain. America the exception is also still America the product of a 2,000-year Western tradition of anti-Semitism. Secondly, Truman’s diaries reveal once again the irrational character of anti-Semitism. It has often been noted that Jews are often accused of being contradictory things: Communists and capitalists, too powerful and too weak. The 33rd American president writes of how “very, very selfish” Jews are and how brutal they are when in power. This, only two years after the Holocaust, when the Jews of Europe were destroyed; when more than one-third of world Jewry was wiped out; when the world, including the United States, largely stood by in the face of the Nazi inhumanity toward Jews, when Jews themselves failed to do enough to try to save their brethren in Europe. Jews were at a low point in their history in 1947. That didn’t seem to stop Truman from attributing classic stereotypes about Jews. The diaries, along with the Nixon tapes, also speak to the variability of anti-Jewishness. Those two presidents were capable of standing up for Israel at critical times, even while sharing many of society’s worst stereotypes abut Jews. Today, things are turned on their heads: Denials of anti-Semitism abound while one-sided criticism of Israel is rife and acceptable. Anti-Semitism is not only the largest hatred, it is the most elastic. I am a Holocaust survivor, a displaced person, and in 1947 I was a stateless 7-year-old waiting to be received by some country other than Poland, Lithuania, Germany or Austria. Harry Truman was my hero, and in 1950, when as displaced persons my parents and I came to the United States, we believed it was the president himself who made it possible. It personally saddens me to learn that he too was so flawed. Truman was a product of his time and of a civilization’s attitudes. The anti-Semitism revealed in his diaries is a stain on his reputation. Still, he remains a hero of Israel. If “Dishonest Abe” Foxman had bothered to quote the very next line in Truman’s diary it would have become clear that the President was making no ditinction between downtrodden Jews who suddenly find themselves with the upper hand, and a whole list of other underdogs – a list which included Russians, Labor, Negroes, Baptists and Mormons, among others. This makes his use of the word “Jews” less grating to my perception, and, given that he was continuously being lobbied and pressured by people who were representing themselves as Jews and in the name and interests of the Jewish people, his use of that term does not seem anti-semitic. Incidentally, I know Jews who are not from Jewish backgrounds and who don’t speak or understand Hebrew beyond certain verses of the Torah, yet ALL of the Arabic-speaking people of the Middle East and Africa ARE ethno-linguistic semites. Therefore I’d say that the foreign policies and wars of the US, Israel and its allies that have and ARE bringing-about the deaths of uncounted millions of Arabs, reduces the usual screams of “anti-semtism” from the likes of Foxman and Dershowitz to something usually found lying in piles in a pasture or a pigstye. flat5 just uses hasbara propaganda to silence critics of Israel. Seems we can be critical of all countries with the exception of one. After the creation of Israel in 1948 isn’t it high time the World Jewish population of 0.2% gave thanks and made peace with the 25 % of the world’s population that is Muslim for the sake of world peace. Israelâ€™s Nuclear arsenal targetted at world capitals is taking us all along the road to Global Armageddon. Imagin if last piece of above comment was uttered by Ahmadinejad !!! When you’re surrounded by 200,000,000 people sworn to your destruction, it’s not too impertinent to insure your survival. It always amazes me that you extoll the virtues of the Arab countries, when you as a woman aren’t even allowed to drive a car in Saudi Arabia. I guess that is very dangerous and would cause a seismological event! I’m the James Carville of this site. ‘Just sick & tired of extreme lefties or right wing religious wingnuts using Israel as their convenient punching bag. Does “out-foxed” mean deceived and or lied to ? Is there an established pattern in the American public being out-foxed by Israel ? Meanwhile murderous conflicts as a result of the creation of Israel continue. 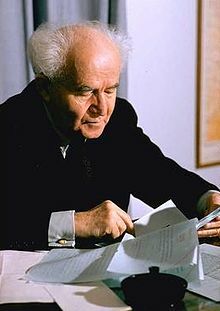 Remember the Balfour Declaration said “it being clearly understood that nothing shall be done which may prejudice the civil and religious rights of existing non-Jewish communities in Palestine” the response from Israel’s first Prime Minister Ben Gurion was “We must expel Arabs and take their places.”: David Ben Gurion, future Prime Minister of Israel, 1937, Ben Gurion and the Palestine Arabs, Oxford University Press, 1985. What was to be done with the Palestinians ? Ben-Gurion’s reply was “Drive them out” quote from Yitzhak Rabin memoirs, published in the New York Times, 23 October 1979. “The only solution is Eretz Israel [Greater Israel], or at least Western Eretz Israel [all the land west of Jordan River], without Arabs. There is no room for compromise on this point … We must not leave a single village, not a single tribe.” Joseph Weitz, Director of the Jewish National Fund, the Zionist agency charged with acquiring Palestinian land, Circa 1940 . Machover Israca, January 5, 1973 p.2. then with the “out-foxing” of JFK ? In his June 1963 letter to Prime Minister David Ben-Gurion JFK insisted on proof “beyond a reasonable doubt” that Israel was not developing nuclear weapons at its Dimona reactor facility. Though his letter was cabled to the U.S. embassy, Ben-Gurion resigned (citing undisclosed personal reasons) before the message could be physically delivered giving Israel time enough as Kennedy was assassinated soon after.. Does there seem to be a pattern to the deception ? Is the clever hasbara propaganda history by “flat5” above overkill ? ..IN ALMOST every Arab capital today, you can find people who believe the theory that Israel masterminded the terror attacks on America on September 11th. Israelâ€™s critics in the West do not go that far. “flat5” doesn’t realize that its more than just “Israel’s critics” who can connect the dots. The 9/11 official story depends on ignorance of the facts. A wingnut on the extreme left is as dangerous as the right wing nuts who masquerade as lovers of Israel. You’re just a conspiracy nut and a closet antisemite. What a rogue state of crazed, religious fanatics. Its comeuppance is nearing. The United States had a special relationship with the Jewish people and its homeland even before the establishment of Israel. Below are some examples of remarks by American Presidents on the subject of Jews and Israel. Recalling the previous experiences of the colonists in applying the Mosaic Code to the order of their internal life, it is not to be wondered at that the various passages in the Bible that serve to undermine royal authority, stripping the Crown of its cloak of divinity, held up before the pioneer Americans the Hebrew Commonwealth as a model government. In the spirit and essence of our Constitution, the influence of the Hebrew Commonwealth was paramount in that it was not only the highest authority for the principle, â€œthat rebellion to tyrants is obedience to God,â€ but also because it was in itself a divine precedent for a pure democracy, as distinguished from monarchy, aristocracy or any other form of government. The American people, ever zealous in the cause of human freedom, have watched with sympathetic interest the effort of the Jews to renew in Palestine the ties of their ancient homeland and to reestablish Jewish culture in the place where for centuries it flourished and whence it was carried to the far corners of the world. This year marks the twentieth anniversary of the Balfour Declaration, the keystone of contemporary reconstruction activities in the Jewish homeland. Those two decades have witnessed a remarkable exemplification of the vitality and vision of the Jewish pioneers in Palestine. It should be a source of pride to Jewish citizens of the United States that they, too, have had a share in this great work of revival and restoration. (Greeting to the United Palestine Appeal, February 6, 1937). Our forces saved the remnant of the Jewish people of Europe for a new life and a new hope in the reborn land of Israel. Along with all men of good will, I salute the young state and wish it well. Israel was not created in order to disappearâ€”Israel will endure and flourish. It is the child of hope and home of the brave. It can neither be broken by adversity nor demoralized by success. It carries the shield of democracy and it honors the sword of freedom. The United States and Israel share many common objectives…chief of which is the building of a better world in which every nation can develop its resources and develop them in freedom and peace. Our society is illuminated by the spiritual insights of the Hebrew prophets. America and Israel have a common love of human freedom and they have a common faith in a democratic way of life. The United States.. has been proud of its association with the State of Israel. We shall continue to stand with Israel. We are committed to Israel’s survival and security. The United States for a quarter of a century has had an excellent relationship with the State of Israel. We have cooperated in many, many fields — in your security, in the well-being of the Middle East, and in leading what we all hope is a lasting peace throughout the world. (Source: White House Press Conference with PM Rabin, September 10, 1974). Let me assure you that in this negotiation, as we work for the legitimate rights of the Palestinians, recognized in the Camp David accords by Prime Minister Begin and President Sadat, that we will countenance no action whcih could hurt Israel’s security. This is because of our commitment to Israel’s security and well-being, and it’s because Israel’s security is so closely linked to the security of the United States of America. … I am opposed to an independent Palestinian state, because in my own judgement and in the judgement of many leaders in the Middle East, including Arab leaders, this would be a destabilizing factor in the Middle East and would certainly not serve the United States interests. (Jimmy Carter at the United Jewish Appeal National Young Leadership Conference, February 25, 1980). And we oppose the creation of an independent Palestinian state. The United States, as all of you know, has a warm and unique relationship of friendship with Israel that is morally right. It is compatible with our deepest religious convictions, and it is right in terms of America’s own strategic interests. We are committed to Israel’s security, prosperity, and future as a land that has so much to offer to the world. A strong Israel and a strong Egypt serve our own security interests. We are committed to Israel’s right to live in peace with all its neighbors, within secure and recognized borders, free from terrorism. We are committed to a Jerusalem that will forever remain undivided with free access to all faiths to the holy places. Nothing will deflect us from these fundamental principles and committments. (Source: First anniversary of the Egyptian-Israeli Peace Treaty / White House joint conference, March 23, 1980). The United States…has a warm and a unique relationship of friendship with Israel that is morally right. It is compatible with our deepest religious convictions, and it is right in terms of America’s own strategic interests. We are committed to Israel’s security, prosperity, and future as a land that has so much to offer the world. The survival of Israel is not just a political issue, it is a moral imperative. That is my deeply held belief and it is the belief shared by the vast majority of the American people…A strong secure Israel is not just in Israel’s interest. It’s in the interest of the United States and in the interest of the entire free world. The meetings with the Presidents of Egypt and Israel and with the King of Jordan form part of a larger effort to bring peace to the Middle East. And I made clear the continuing readiness of the United States to facilitate this effort in a manner that’s consistent with the security of Israel and the security of our Arab friends in the region as well. (President’s News Conference in Japan, February 25, 1989). The friendship, the alliance between the United States and Israel is strong and solid, built upon a foundation of shared democratic values, of shared history and heritage, that sustains the life of our two countries. The emotional bond of our people transcends politics. Our strategic cooperationâ€”and I renew today our determination that that go forwardâ€”is a source of mutual security. And the United Statesâ€™ commitment to the security of Israel remains unshakeable. We may differ over some policies from time to time, individual policies, but never over the principle. For more than 40 years, the United States and Israel have enjoyed a friendship built on mutual respect and commitment to democratic principles. Our continuing search for peace in the Middle East begins with a recognition that the ties uniting our two countries can never be broken. Zionism…is the idea that led to the creation of a home for the Jewish people….And to equate Zionism with the intolerable sin of racism is to twist history and forget the terrible plight of Jews in World War II and indeed throughout history (Address to the United Nations, September 23, 1991). Our relationship would never vary from its allegiance to the shared values, the shared religious heritage, the shared democratic politics which have made the relationship between the United States and Israel a specialâ€”even on occasion a wonderfulâ€”relationship. The relationship between our two countries is built on shared understandings and values. Our peoples continue to enjoy the fruits of our excellent economic and cultural cooperation as we prepare to enter the twenty-first century. (Clintonâ€™s reply after Israeli Ambassador Shoval presented his credentials, September 10, 1998). We will speak up for our principles and we will stand up for our friends in the world. And one of our most important friends is the State of Israel (Speech to American Jewish Committee, May 3, 2001). Israel is a small country that has lived under threat throughout its existence. At the first meeting of my National Security Council, I told them a top foreign policy priority is the safety and security of Israel. My Administration will be steadfast in supporting Israel against terrorism and violence, and in seeking the peace for which all Israelis pray (Speech to American Jewish Committee, May 3, 2001). Through centuries of struggle, Jews across the world have been witnesses not only against the crimes of men, but for faith in God, and God alone. Theirs is a story of defiance in oppression and patience in tribulation â€” reaching back to the exodus and their exile into the diaspora. That story continued in the founding of the State of Israel. The story continues in the defense of the State of Israel (Address to the National Commemoration of the Days of Remembrance, April 19, 2001). â€œThe alliance between our governments is unbreakable, yet the source of our friendship runs deeper than any treaty. It is grounded in the shared spirit of our people, the bonds of the Book, the ties of the soul. â€œA strong and secure Israel is in the national security interest of the United States not simply because we share strategic interests, although we do both seek a region where families and children can live free from the threat of violence. Itâ€™s not simply because we face common dangers, although there can be no denying that terrorism and the spread of nuclear weapons are grave threats to both our nations. “America’s commitment to Israel’s security is unshakeable, and our friendship with Israel is deep and enduring. And so we believe that any lasting peace must acknowledge the very real security concerns that Israel faces every single day. Let’s be honest: Israel is surrounded by neighbors that have waged repeated wars against it. Israel’s citizens have been killed by rockets fired at their houses and suicide bombs on their buses. Israel’s children come of age knowing that throughout the region, other children are taught to hate them. Israel, a small country of less than eight million people, looks out at a world where leaders of much larger nations threaten to wipe it off of the map. The Jewish people carry the burden of centuries of exile, persecution, and the fresh memory of knowing that six million people were killed simply because of who they were. 2Remarks in New York City on Receiving the Charles Evans Hughes Gold Medal of the National Conference of Christians and Jews, March 23, 1982. 3 Address to the Nation on United States Policy for Peace in the Middle East, September 1, 1982. 4Remarks at a White House Meeting With Jewish Leaders, February 2, 1983. 5 Remarks at the Welcoming Ceremony for President Chaim Herzog of Israel, November 10, 1987. ..IN ALMOST every Arab capital today, you can find people who believe the theory that Israel masterminded the terror attacks on America on September 11th. Israel’s critics in the West do not go that far. But many argue that Israel is indirectly to blame, because the protection it receives from America makes America itself a target of Muslim rage. America, in short, is paying for the crimes of Israel. The crude version of this argumentâ€”if Israel did not make Arabs angry, the attack might not have happenedâ€”can be swiftly disposed of. In Osama bin Laden’s 1998 fatwa against America, Israel ranks lastâ€”after America’s â€œoccupationâ€ of Saudi Arabia during the Gulf war and its continuing attacks on Iraqâ€”among the three causes he gives for his war against America. His first big atrocity, the bombing in 1998 of American embassies in Kenya and Tanzania, coincided with a time of unusual optimism in the Israel-Palestine peace process, well before the outbreak of the Palestinian intifada. He has shown scant interest in the Palestinians; and they, to their credit, have so far shown scant interest in him. A second line of argument holds that support of Israel blackens America’s reputation in the Arab and Muslim worlds and so complicates its attempts to build a coalition against terror. This is undeniable. If the Jewish state did not exist, America’s relations with the Arabs would be simpler. James Forrestal, America’s defence secretary, foresaw this in 1948, when he tried to talk Harry Truman out of recognising the new state, lest this antagonised the Arabs and hampered American access to their oil. But since Israel does exist, and has a birth certificate from the United Nations, it is right for America to support it. The charge that matters is that America’s support has been one-sided and excessive. On this view, America has succoured Israel financially, armed it to the hilt, encouraged its expansion and turned a blind eye to the pleas of its downtrodden victims, especially the Palestinians. As George Bush is now discovering to his cost in his war against terrorism, most Arabs hold this truth to be self-evident. It is not. The evidence of historyâ€”always such a boreâ€”repays examination. When is this unholy alliance between Israel and America supposed to have started? Not right away. For the first 20 years of Israel’s life America was a sympathetic friend rather than a close ally. Truman himself kept the new state at arm’s length. In 1957 Eisenhower forced Israel out of the Sinai peninsula, which it had invaded as part of the Anglo-French Suez adventure. Until the mid-1960s France, not America, supplied Israel with its weapons. No American president set foot in the country until Richard Nixon. The change came in 1967. Israel’s remarkable victory in the six-day war captured the imagination of American Jews, led to the formation of a powerful Israel lobby in America’s domestic politics and planted the idea among some American politicians that Israel might be a useful helper in the cold war. As a dynamic westernised democracy, Israel played better in America than the Soviet-oriented Arab dictatorships of Syria and Egypt. But at no point did America endorse the idea that the lands Israel captured in 1967 could be legitimately held. Since 1967, America has stood behind the land-for-peace formula enshrined in Security Council Resolution 242. Successive administrations have declared Jewish settlements in the territories illegal under international law and an obstacle to peace. Should America have done more after 1967, beyond fine words, to implement Resolution 242? Perhaps. But those who say so forget how matters between Israel and the Arabs have stood over the years. From 1948 until Egypt alone broke ranks in 1979, the Arab states and Palestinians alike refused to accept Israel’s right to exist under any circumstances and within any borders. As for Resolution 242, the Palestinians themselves rejected it out of hand. There could, said the Arab League from Khartoum that year, be no negotiation, recognition or peace with the Jewish state. This intransigence is now history. Few governments, save Iraq and Iran, still propose sweeping Israel away. But history has consequences. One was to make it easier for Israel to plant settlements: many early ones were justified on strategic grounds, which made some sense when its neighbours were bent on Israel’s destruction. Another was to block diplomacy. How could America be â€œeven-handedâ€ when one side’s demand was the eradication of the other? The Arabs’ rejection continued for an unconscionable period. Yasser Arafat’s Palestine Liberation Organisation waited until 1988â€”40 years and five wars lateâ€”before renouncing terrorism and recognising Israel’s right to exist. Mr Arafat’s 1988 decision was a breakthrough. And when such breakthroughs have created chances for mediation, most American presidents have tried to grab them. Richard Nixon saw the conflict through a cold-war prism, with the Middle East as a place to win client states and avoid a superpower war. But even he tried to push the disengagement agreements after the 1973 Yom Kippur war into something more substantial. Jimmy Carter, with a Christian faith in the possibility of peaceful compromise, tried hard to turn Anwar Sadat’s stunning trip to Jerusalem into a broader Arab-Israeli settlement. He drafted the first version of the Camp David agreement, and pored over maps of the Sinai. As a reward for the 1979 Egypt-Israel treaty, Congress gives Israel $3 billion of aid a year and Egypt $2 billion. Ronald Reagan, though an admirer of Israel, bitterly opposed Menachem Begin’s invasion of Lebanon in 1982, and sent American marines, some of whom were killed, to oversee the evacuation of the PLO from Beirut. After the eruption of the first Palestinian intifada in 1987, George Shultz, his secretary of state, offered to start talks with the PLO if Mr Arafat renounced terrorism. When at last Mr Arafat did so, the administration of George Bush senior, no fan of Israel, brushed aside the protests of Yitzhak Shamir, Israel’s Likud prime minister, and authorised the State Department to begin a â€œsubstantive dialogueâ€ with the PLO. In 1991, after the Gulf war, Mr Bush dragged a reluctant Mr Shamir to a peace summit in Madrid. There is a myth that American policy in the Middle East has been hijacked by AIPAC, the mighty Jewish lobby in Washington. But presidents beat foreign-policy lobbies, if they can be bothered to try. When AIPAC tried to stop Mr Reagan from selling AWACS aircraft to the Saudis, the president won handily. In 1989, James Baker, George Bush senior’s secretary of state, went to AIPAC’s annual convention and denounced Mr Shamir’s belief that Israel should hold on to the West Bank and Gaza. In 1991 he brushed off AIPAC’S objections when America threatened to withhold loan guarantees if Israel continued to expand its settlements. This is not the record of a superpower with no interest in peace or justice. That is why much of the present criticism of America homes in on the past decade. In one such article, Anatol Lieven, of the Carnegie Endowment for International Peace, accused America of sticking to policies which were needed when Israel’s existence was threatened but are no longer justified. Strange, though, that Americans should face such a charge now, when they have just invested ten years of diplomacy in an attempt to create an independent Palestine alongside Israel in the West Bank and Gaza. Bill Clinton, in particular, made a supreme effort. He brought Mr Arafat and Mr Rabin together on the White House lawn, and presided over a peace treaty between Israel and Jordan. He was fond of Israel and especially Yitzhak Rabin, but thrilled the Palestinians by visiting the Gaza strip in 1998. At Camp David last July, he came within fingertip reach of mediating a final deal between Ehud Barak and Yasser Arafat. What went wrong? The answer is hidden in a fog of recrimination. The Palestinians say that the summit was premature, bungled, and that Israel conceded too little: not really a proper state. Dennis Ross, the senior American diplomat involved, says that Israel put a generous offer on the table and that Mr Arafat, trapped in a mythology of victimhood, failed to respond. But Mr Clinton has left little doubt about his own preference. He proposed the creation of a Palestinian state. This state would be created in Gaza and on 95% of the West Bank. It would also get a sliver of Israel proper, to compensate it for some settlement blocks that would be annexed to Israel. Settlers outside those blocks would come under Palestine’s sovereignty. The new state would have its capital in East Jerusalem, and divided sovereignty on the Temple Mount. Palestinian refugees would be resettled either in the Palestinian state or in other countries, with some tens of thousands returning to Israel proper. Appealing to the Arab worldReuters.If this was the American position, does it reflect a bias towards Israel? Bias is in the eye of the beholder. What is plain is that the Clinton plan is consistent with the principle of self-determination and with the land-for-peace principle enshrined in Resolution 242. This, by the way, does not call, as is sometimes alleged, for Israel’s unilateral withdrawal from all of the territory it occupied in 1967. It says that Israel should withdraw, in the context of a peace agreement, to secure and recognised boundaries. By design, it leaves open the possibility of altering the 1967 borders. Despite this, American administrations have declared over the years that they foresee only minor border rectification; and Mr Clinton stood by this at Camp David. To judge by the wails that went up on the Israeli right when Mr Clinton’s ideas were published, America was not serving just then as Israel’s stooge, pursuing obsolete policies. So America’s alleged guilt presumably arises not from Camp David, but from the six years before it, when the Oslo peace process appeared to stagnate. This is the wisdom of hindsight. In 1993, when it became known that the Israelis and Palestinians had at last been holding secret talks with one another, instead of working through intermediaries, it made sense for the intermediaries to step back. Moreover, helped along by the Americans, Oslo did produce an agreementâ€”and big changes on the ground. Israel withdrew from the main populated areas, the PLO returned from exile and Mr Arafat set up his Palestinian Authority. The expectation was that five years of self-rule and confidence-building would culminate in an independent Palestine. That this timetable slipped was hardly America’s fault. Progress was disrupted by violent events, notably the assassination of Labour’s Yitzhak Rabin and the electionâ€”after a campaign of suicide bombings by Hamas terroristsâ€”of an obstructive Likud-led government under Binyamin Netanyahu. By 1999, however, a new Israeli government under Mr Barak was impatient to negotiate a final peace on all fronts. Mr Barak turned first to Syria and Lebanon, without success. By the following summer he was putting his own offer of statehood to Mr Arafat at Camp David. When George Bush became president this year, things had fallen apart in style. Camp David had failed, the Palestinians had launched a new intifada and Ariel Sharon, a hardliner from the Likud Party, had replaced Mr Barak. Having watched Mr Clinton bash against a brick wall, the new president was reluctant to dive straight after him. By Mr Clinton’s exacting standards, he has been relatively disengaged. This, predictably, has given rise to a new charge of bias. America fiddles while Gaza burns, pounded by Israel with American-made weapons. Why don’t the Americans simply instruct their client to stop the carnage? Easy to say. But the violence is not one-sided. It has, in point of fact, been initiated by the Palestinians. Justly or not, they believe themselves to be fighting for national liberation. Their aim is to drive Israel from the territories by force, and their means include shooting Israeli soldiers, ambushing motorists, planting mines and car bombs, andâ€”in the case of Hamas and Islamic Jihadâ€”suicide bombings of youth clubs and pizza parlours. Israel’s aim is to stop them. Its means include blockades, curfews, lethal gunfire against demonstrators and the assassination, often by helicopter gunship, of alleged ringleaders. America can blow a whistle, and hope for a pause, but neither side has been keen, during this trial of strength, to retreat under fire. Now that America needs allies, it is working harder than ever to make a ceasefire stick. Mr Arafat has been quicker than Mr Sharon to spot the advantage to be gained by announcing compliance. But the Americans were blowing their whistle well before September 11th. Since the start of the intifada, the State Department has called many times on the Palestinians to cease their attacks and on Israel to cease its â€œexcessiveâ€ reactions. George Tenet, the director of the CIA, travelled to the region to revive security co-operation between Israel and the Palestinian Authority. An American-led commission under former Senator George Mitchell has put forward the only existing route map from a ceasefire, via confidence-building measures, back to political negotiations. Again, the record does not point to an America that has turned its back insouciantly on a region in flames. Some critics of American policies take a different tack. America’s problem in the Middle East is not that it is biased but that it strives to be even-handed in an uneven conflict. In a quarrel where one side (the Israelis) is strong and wrong and the other (the Palestinians) is weak and right, the proper job of the superpower is not to split the difference but to impose justice. Fineâ€”if you accept the premise, and can work out where justice lies. But this is to treat the past decade of peacemaking, and the upheavals it has caused inside Israel, as if they had never happened. Back in the days of Begin and Shamir, Israel’s Likud governments really did hope for eternal Jewish dominion over the whole of the West Bank and Gaza. But during the past ten years Israel has had two prime ministersâ€”Mr Rabin and Mr Barakâ€”convinced of the need for Israel to let an independent Palestine clamber to its feet in the West Bank and Gaza. Both tried to forge such an agreement with Mr Arafat. Mr Rabin put his faith in the gradualism of Oslo, and is now criticised for his caution. Mr Barak pushed for a final deal at Camp David, and is now criticised for his impetuosity. And still it goes onEPA.The failure of Camp David, and the subsequent election of Mr Sharon as prime minister, do not mark a return to the folly of Greater Israel. His election was a product of the intifada, not a cause of it. Though a Likudnik, with territorial ambitions, he leads a broad coalition united mainly by a desire to subdue the uprising in a way that betrays no weakness. His harsh tactics in the territories are supported, by and large, by Mr Barak and other Labour politicians. The peace camp in Israel has been gravely weakened by Mr Arafat’s rejection of what Israelis considered a fair settlement, and even more by the spectacle of the Palestinian Authority, created to â€œbuild confidenceâ€, turning its guns on Israel. But the intifada has also made it plainer than ever to many Israelis that perpetual rule over the territories is an impossibility. If the guns fall silent, Israel’s debate about what to do about the territories will flare back to life. Hope may flare, too, but much will depend on America. It has already played an indispensable role in peacemaking: giving Israel the weaponry to make the radical Arab states realise that destroying Israel is not a near-term option, brokering peace with Egypt and helping to close the Oslo deal, giving cash inducements to Egypt and Jordan as a reward for their peacemaking efforts, helping Israelis overcome their feelings of isolation and abandonment by the non-Jewish world. When he has completed his war against terrorism, and debts fall due from his Arab helpers, Mr Bush may show less patience than previous presidents towards Israel’s fears. With America’s own security at stake, Mr Bush will care less about Israel’s. But in that case, America will not be paying for the crimes of Israel; Israel will be paying for the crimes against America. Hey hasbarat, nice of you to preface your below remarks with this concise two-word summary. Theyâ€™re not even his own comments. Flat5 is only copying and pasting articles from other Hasbara websites.